With more than 20 years experience in audio looping innovation, DigiTech, a Harman international company (NYSE-HAR), and a leading manufacturer of guitar, bass and vocal processors, announce the release of its JamMan Delay Looper. The JamMan Delay Looper features true stereo looping with a fully programmable stereo delay and ultimate control over each effect. The JamMan Delay Looper boasts attributes never-before-offered by stage-ready, individually controlled loopers. With 35 minutes of built-in memory for each of its 99 internal loop memories and an SD card expansion, the JamMan Delay Looper is capable of storing more than 16 hours of CD-quality audio. The newest addition to the DigiTech JamMan line offers 16 seconds of stereo delay time, a tap tempo footswitch and expression pedal input for full morphing capability per each of its eight delay types or control of the looper playback. The looper's stereo delay can be recalled through three fully programmable presets via dedicated footswitches. "The JamMan Delay Looper enhances the capabilities of guitarists and bassists playing gigs from an open mic to a sold out concert hall," said Jason Lamb, Marketing Manager for DigiTech. "Our goal is to continuously provide players with new ways of expanding their capabilities and developing their skills. 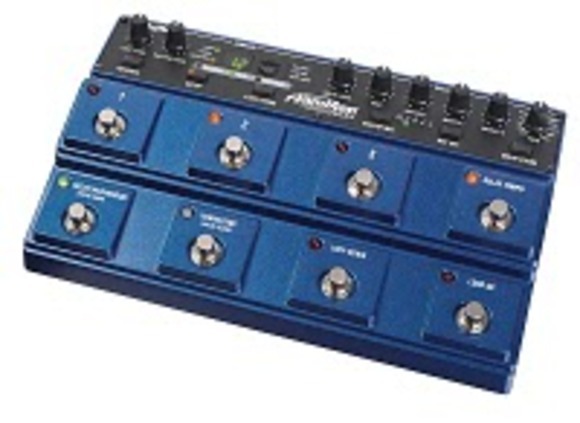 The JamMan Delay Looper will take artists to the next level through their performances." USB capability syncs the JamMan Delay to a users PC or Mac using the downloadable JamManager looper librarian software to backup all compositions. The free JamManager software also allows musicians to create custom loop JamLists for each gig. The JamMan Delay Looper will be shipping in May 2010 with an MSRP of $519.95.